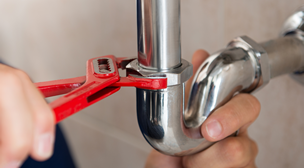 On-call, experienced plumbers who can help you 24/7, at great, affordable rates. Need to schedule a time that's convenient for you? Give us a call! NEED AN AFFORDABLE PLUMBING QUOTE? Plumbing fixtures and systems are mechanical “things.” And like all things mechanical, sooner or later they’re prone to malfunction or completely break down. That’s the bad news. The good news is that no matter what the issue, Apperson Plumbing Service, Inc. Service can fix it right, and usually right away. Of course, these are the problems you can usually see or hear. But what about hidden leaks, like those behind your refrigerator that you might never notice until water has caused damage to your sub-flooring? Apperson Plumbing Service, Inc. offers electronic leak detection to help guard against future problems while making current repairs that much more precise. 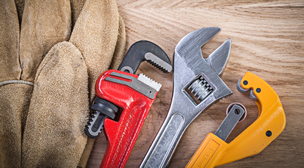 For repairs or new installations, take the guess work out of plumbing, and contact Apperson Plumbing Service, Inc. Service. A steady supply of hot water is more than something you depend on. More likely than not, you take it for granted. At Apperson Plumbing Service, Inc., we pride ourselves on fast and responsive service . . . whether the job entails a water heater repair or replacement. First of all, rest assured that we service and repair all makes and models. Traditional storage tank models that come in multiple tank sizes to provide you and your family with all the hot water you need even in times of maximum use. Tankless water heaters that provide hot water “on demand” and with all the supply you need. Tankless unit consume less energy since there’s no standing supply of water that must constantly be kept heated. They last longer, too. Contact Apperson Plumbing Service, Inc. today for all the details, and for a no-obligation quote on a new or replacement water heater to last you for years and years to come. A drain line has only one purpose in life. To move water from point A to point B. But when water starts returning to point A, or bursting through an underground pipe to points C, D, E and beyond…well, the result can be unpleasant, to say the least. So how can you prevent clogs in the first place? Check your sink and tub stoppers at least four times a year for hair and bio-film buildup. Once a week, fill each sink in your home to the brim and then pull up the stopper. The volume and weight of the water will help flush the drain lines. Once a month or so, pour an organic drain cleaner down each of your drains. Products like Bio-Clean work much better than the chemical drain cleaners and won’t damage your fixtures or pipes. Never pour oil or grease down a drain . . . instead, use a jar that you can later discard. But should a clog occur anyway, try using a plunger first. You can count on us for all facets of drain cleaning, including our video inspection service that allows us to locate the exact source and extent of the problem . . . fast! For really stubborn clogs, nothing does the job like our high-speed water jetting service! It removes the clogging material and cleans out your drain pipes from one end to the other. Looking for service now? Then you’ve definitely come to the right place. 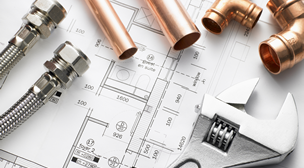 Apperson Plumbing Service, Inc.
For new or existing homes, Apperson Plumbing Service, Inc. provides expert drain line and gas pipe installation. Today we use PVC piping to prevent corrosion and give you a lifetime of reliable service. No job too small, no job too big. That’s the Apperson Plumbing Service, Inc. Service way. Our plumbers are trained in drain cleaning (rooter service) of both commercial and residential properties. Quarterly rooter service is a good preventative way to keep your sewer lines flowing and we can schedule this for you. We have a camera designed especially for sewer lines which enables our plumbers and customers to see the condition of their sewer line, in order to correctly diagnose the problem. When something goes wrong with your plumbing, it’s not just about getting it fixed. It’s about having a qualified and licensed technician enter your home or place of business . . .someone you know . . . someone you can trust. If that’s the kind of plumber you want, and don’t already have, then Apperson Plumbing Service, Inc. Service is the company for you. We analyze the problem before we attempt to repair it. We guarantee labor for one year. We thoroughly clean up the work area when we’re done. It’s for these reasons and others that first-time customers become lifetime customers . . . of Apperson Plumbing Service, Inc. We hope to earn that same opportunity with you . . . so please, contact us for service today. Copyright 2018 Apperson Plumbing Service. All rights reserved.